The Penguins have one series down with three left in their quest to win the franchise a fourth Stanley Cup, and to do so they'll have to move past a familiar opponent they haven't faced in a postseason series since they won their 3rd Cup in 2009. The Washington Capitals ran away with the Presidents' Trophy this season, finishing with 120 points, but they looked vulnerable down the stretch with nothing to play for. Pittsburgh, on the other hand, dominated their opposition in winning 14 of their final 16 regular season games. After a slow start against the Rangers with Jeff Zatkoff in goal, the Pens rebounded nicely with Matt Murray in net and chased Henrik Lundqvist in their final two wins. The Capitals meanwhile had little difficulty in snuffing out the Philadelphia offense, allowing just 6 goals (with one an ENG) in their 6 games series. One of the big reasons behind that was the play of goaltender Braden Holtby, who was recently named a finalist for the 2015-16 Vezina Trophy along with Ben Bishop and Jonathan Quick. After managing a 0.922 SV% and 2.20 GAA with a league high 48 wins, Holtby turned it up a notch against the Flyers in the first round with a 0.968 SV% and 0.84 GAA. However, he'll face arguably the hottest offense in the league in the second round, and the Penguins have averaged just shy of 4 goals per game over their last 25 games spanning the regular season and the first round series against New York. They've also had success against Holtby this year, limiting the goalie to a 0.913 SV% and 2.90 GAA in 5 meetings this season, including scoring a combined 9 goals over their past two contests. If the Pens can continue to score on Holtby it will go a long way towards helping them prevail in the series, because the opposing offense is no slouch either. The Capitals were 2nd in the league this year with a 3.02 goals per game average, and they also had the NHL's 5th best power play at 21.9%. Alexander Ovechkin led the league with 50 goals, while Evgeny Kuznetsov led the team, and placed 9th in the NHL, with 77 points. Nicklas Backstrom gives Washington a trio of players who hit the 70 point mark this year along with Kuzentsov and Ovechkin (71 points), and they Caps also have other talented players like Justin Williams (52 points) and T.J. Oshie (51 points) who can create offense in the top 6. It was a bit of a mixed bag for the Washington top 6 against the Flyers, as Backstrom (2g, 5a), Ovechkin (3g, 2a) and Oshie (1g, 3a) were able to find success against Philly while the second line of Kuznetsov (1g), Williams (2a), and Andre Burakovsky (0 pts) were largely held in check. 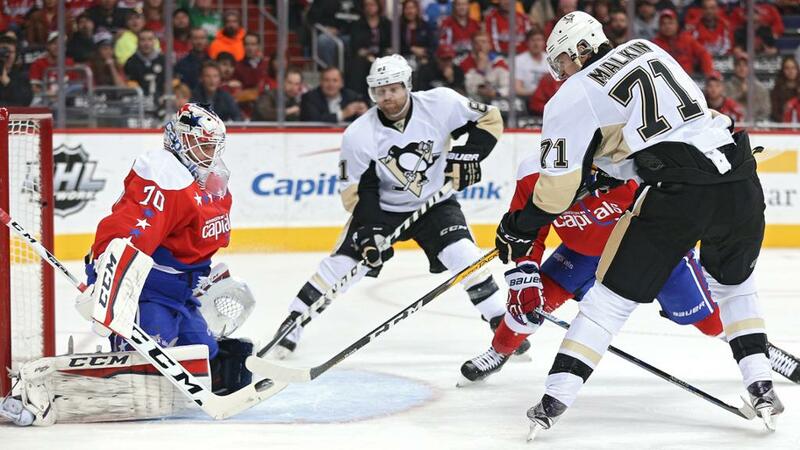 The Capitals offense was held in check for the most part, scoring just 14 goals (2.33 G/gm) in the first round. They'll need to be better in the second round as it's unlikely that Washington will be able to have the same success preventing the Penguins from scoring. Part of the reason why is that it's not a particularly deep or strong blue line for the Capitals. John Carlson is one of the better offensive defensemen in the league with 39 points in 56 regular season games this year, but the talent level falls off quickly after him. Matt Niskanen and Karl Azner have formed an effect pairing, but Brooks Orpik has been a drain on Washington's possession, Taylor Chorney is a bit player who's bounced around the NHL and AHL looking for a home, and Dmirty Orlov and Nate Schmidt are relatively green players who will see their ice time sheltered against the strong Pittsburgh forward group. - Alexander Ovechkin was held without a point in all 5 regular season games between the two teams this season, a result the Pens would surely like to see continue in the playoffs. - Conor Sheary missed the previous two practices, but there doesn't seem to be a concern over his availability for Game 1.